ARES program administrators at ARRL HQ will phase out the traditional ARES report forms later this year in favor of an online system called ARES Connect -- a new volunteer management, communications, and reporting system. The new system will allow information to be logged by ARES members and managed through the Field Organization. It does not change how ARES operates when serving a partner entity; it is simply a system that will make managing volunteers and incidents/events easier. Beta testing of ARES Connect began in March. At the ARRL Member Forum at 2018 Hamvention® last month, hosting Great Lakes Division Director Dale Williams, WA8EFK, chairman of the ARRL Public Service Enhancement Working Group, spoke about the dramatic changes that are occurring among agencies serving in the emergency/disaster response sector. He discussed planning for proposed new guidelines for participants in the ARES program, including plans for a new volunteer management software system, called ARES® Connect (see above). Upgrades to ARES training and resources will ensure the service continues to be a valuable partner for its served agencies into the future. Williams' program was titled ARES Advances into the 21st Century -- A New Program, A New Mission. The vision is for an ARES that is comprised of organized, trained, qualified, and credentialed Amateur Radio operators who can provide public service partners with radio communications expertise, capability, and capacity. Goals include aligning the ARES organizational structure with the National Incident Management System (NIMS) and Incident Command System (ICS). The Emergency Coordinator (EC) will continue to lead the ARES team locally during an incident, while the District EC and Section Emergency Coordinator will continue to serve as resources and support for the EC. ARES Connect is the new platform designed to support Reporting, Membership, Database - Portability, Record Keeping, and Statistics. It is envisioned that additional training will be mandated, including ARRL Emergency Communications courses and the now standard FEMA NIMS/ICS courses IS-100, 200, 700, 800, with IS-300 and 400 for higher levels. Other specialty courses will be required in certain cases such as SKYWARN and other agency-specific training. Levels of training attained would dovetail with three new levels of participation: Level One would be comprised of all entering the program with no training, while progressing through the ARRL emergency communications training and the FEMA Independent Study courses 100, 200, 700, and 800. Level Two would be attained upon successful completion of these courses, and would be considered the "Standard" level for ARES participants. Level Three would be attained upon completion of the advanced FEMA courses IS 300 and 400, which would qualify candidates for the ARES leadership positions EC, DEC, SEC and Assistants. Level One participants would be able to fulfill most ARES duties with the target of attaining Level Two in one year. Level Two would be considered the normal participant level, which would gain the participant access to most incident sites and EOCs. Level Three would convey full access as granted by the Authority Having Jurisdiction (AHJ), and qualification for ARES leadership. It is proposed that ARRL will provide a basic ARES ID, which would convey recognition of registration with ARES nationally and indicate level of training. No conveyance of site access is guaranteed. The AHJ would grant an additional ID/pass for site access, which would be "owned" by the AHJ. The ARES Connect system is currently being field-tested and implemented, with ARRL HQ staff undergoing training in its administration, and group registrations currently being made. Group IDs are being assigned. Beta testing with four ARRL Sections with large ARES organizations is underway. The plans as described above are pending approval by the ARRL Board of Directors. An ARES Strategic Plan for the ARRL Field Organization, and an Introductory Announcement are being drafted. Editing/updating ARRL ARES-related publications is underway. A full article on the ARES enhancements, once approved, will appear in September QST. 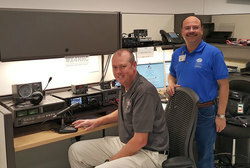 Julio Ripoll, WD4R, Assistant Coordinator for the National Hurricane Center's amateur station WX4NHC in Miami, Florida, reported a highly successful annual test event, and thanked all who supported it so enthusiastically. beginning of this month and runs through November 30th. This event is good practice for ham radio operators worldwide, and helps NWS offices across the country become familiar with Amateur Radio communications support services available during times of severe weather. Ripoll said "We had a very successful on-the-air test. All of our radios and antennas worked well (HF, and VHF/UHF systems)." He added, "Even with our equipment maintenance and software updates, we were able to make more than 150 contacts nationwide, including with stations in the Caribbean and South America." A few dozen contacts were made on the EchoLink Hurricane Practice Net. Ripoll offered special thanks to Rob Macedo, KD1CY, and the VoIP Hurricane Net team. Several contacts were made on the Florida SARNET, which links over 25 UHF repeaters statewide, including many EOC offices. Dozens of weather reports were also received from stations using HF Winlink. The National Weather Service predicted and alerted via WEA (wireless emergency alerts) and NOAA weather radio of flood warning across numerous locations in Maryland and the District of Columbia that occurred on Sunday, May 27th. As many watched Hurricane Alberto, radio amateurs in Maryland watched more and more rain locally. By 5 PM heavy rain, as much as 8" to 10" soaked portions of central and southern Maryland. And again, much like 2016, flooding with heavy damage occurred in historic downtown Ellicott City. Other areas also impacted were the cities of Arbutus, Dundalk, and Catonsville. Perry Hall and Patapsco State Park needed emergency high water rescues. While other Maryland jurisdictions received less rain, upstream flooding continued to flow into the western area along the Chesapeake Bay through Southern Maryland. ARRL Maryland-DC (MDC) Section radio amateurs monitored media and checked the civilian APRS weather stations for added situational awareness. The MDC Section Manager, Marty Pittinger, KB3MXM, was monitoring these conditions when he received several notifications from local radio amateurs of serious flooding occurring in numerous locations. SM Pittinger immediately contacted his section staff and decided by 6:30 PM to activate ARES in eight counties of central Maryland. Anne Arundel, Prince Georges, and Howard Counties covered the majority of flood affected communities. The Frederick County ARES Emergency Coordinator offered mutual aid if needed. Maryland Governor Larry Hogan declared a State of Emergency at 7 PM. Fifteen minutes later more than 40 ARES operators reported to their respective 2-meter nets in five counties.Then, Pittinger contacted Section Traffic Manager Al Nollmeyer, W3YVQ, to alert him of the potential need for NTS traffic handling support. Pittinger maintained contact with Section Emergency Coordinator Jim Montgomery, WB3KAS, Assistant SM Wanda Montgomery, KA3AHI, Assistant SM for External Affairs and Public Information Coordinator Ken Reid, KG4USN, Assistant SM Allen "Brownie" Brown, KZ3AB, and ARRL Atlantic Division Director Tom Abernethy, W3TOM. These communications continued throughout the evening. Operators provided radio communications covering an area of 70 x 80 miles or more than 5600 square miles for six counties. ARES Net Control designated a station to monitor MDC EchoLink *WASH_DC*. HF 80-meter NVIS coverage was also verified usable. Other radio operators enlisted SKYWARN® information, and announced NOAA NWS warnings. Regular situational awareness updates were shared throughout the nets to ensure communication readiness for served agencies, community leadership, neighbors, first responders and fellow radio amateurs. SM Pittinger had early evening contact with the Maryland Department of Health Service, part of the Maryland Emergency Management Agency (MEMA). Anne Arundel County ARES and Howard County ARES were in communication with their local emergency management agencies and were both told to stand by in case of need. Cellular, commercial and private radio systems continued to function properly without much congestion or outages during the heavy weather. Local media outlets provided continuous coverage. There were reports of road closures, power and natural gas outages, and flooded roads. FEMA, the Federal Emergency Management Agency and formal partner agency of the ARRL, offers a wealth of information, updates and alerts on a wide range of emergency and disaster response topics by email subscription. These topical advisories and alerts are relevant to ARES participants, and readily subscribed to by clicking here. Simply subscribe by checking the boxes; unsubscribe by un-checking the boxes. Access your subscriber preferences to update your subscriptions or modify your password or email address without adding subscriptions. Subscribers can opt to receive FEMA declarations, such as Emergency Declarations, Fire Management Assistance Declarations, Major Disaster Declarations, Disaster Updates by FEMA regions of the country, and Updates During Disasters. Featured FEMA Updates include registration information and updates for America's PrepareAthon, which motivates people and communities to take action to prepare for and protect themselves against disasters. ARRL has supported the preparedness program, and since 2003, has been an affiliate of Citizen Corps, under the four charter Citizen Corps programs--Neighborhood Watch, Volunteers in Police Service, Community Emergency Response Teams and Medical Reserve Corps. Get updates on 2018 America's PrepareAthon plans. Subscribers can also receive Citizen Corps News and Updates during disasters, and updates on the Community Emergency Response Team (CERT) program. For information on the Department of Homeland Security's Center For Faith-Based & Community Initiatives, and Neighborhood Partnership, check the relevant box. FEMA's Emergency Management Institute's mission is to train, exercise and educate to improve the competencies of Emergency Management at all levels. The EMI is home for FEMA's well known Independent Study (IS) program, where ARES participants and others can take the NIMS and ICS (and numerous other topics) online courses. Email subscribers can receive a wide array of EMI news and updates, including on the Independent Study courses. Other news and updates are available on topics such as HAZMAT, IT, Mitigation (Grants Policy), Communications and Outreach, Risk Analysis Branch, and, of course, the National Incident Management System (NIMS). Emails are available for the FEMA National Level Exercise, National Response Framework, FEMA Daily Operations Briefing, and much more. If your extended thumb arm's length does not cover a HAZMAT scene, you're too close. If your thumb covers the scene you're between 1/4 and 1/2 mile away. The Pacific Palisades Amateur Radio Emergency Group (PPAREG) of California has started a communication practice setup that may be of interest to your readers. The driving factor is that regular land line phone service is becoming a victim of cord cutting -- with widespread loss of power, it is anticipated that more than half of the residents will not have recourse to 911 in any form. The 911 system could be down as well. In such a scenario, in a disaster situation, radio amateurs can canvass their neighborhoods to attempt to assess what has happened. So, for our practice sessions, we have selected a local group of blocks known as the "Alphabet Streets." The idea is to observe, collect and communicate. An on-site net control is assigned as a data collection point, while others are assigned to walk the blocks and make reports block by block. All participants rotate assignments and experience all communication positions. We learn from mistakes and speed of data intake issues. Learning and proficiency comes from actually performing the functions in the structured environment communication and data exchange. For data observation practice, we have started with counting parked cars on a given street, going from intersection to intersection. It's simple and non-intrusive. Message traffic counts usually amount to several dozen per operator rover/base pair for a one hour session. Other practice is to count other things such as parkway trees, motorcycles and trucks. Then, we assign these counts real life attributes such as number of residents, gas leaks, power lines down, residence fires, non-ambulatory injuries, victim non-responsive, etc. The collected findings are reported out on the appropriate ICS forms. Our community of some 30,000 residents is situated between the mountains and the Pacific Ocean. Landslides can block road access, take down infrastructure and residents are cut off and left to manage on their own. They are the focus of our assessments, outreach and communications, to help them get the assistance they need. A new Handheld Radio Field Guide may make it simpler to program radios in the field. Participate in enough incidents and public service events and you'll know that sometimes radios need to be changed on the fly. That's a capability that's built in to most modern handheld ham radios (HTs). But the way it's done varies from radio to radio. A new book may make it easier: The Handheld Radio Field Guide provides pictures and instructions for front-panel programming (FPP) of over 65 radios you might see at events and incidents today - or in a "New Ham" class. "People who are having trouble programming their radios need quick solutions, and don't want to have to search 200 page manuals, even if they remembered to bring them," said author Andrew Cornwall, KF7CCC. "An Amateur Radio event coordinator can hand this book to a ham who's having trouble programming, and the problem will get resolved." The Handheld Radio Field Guide explains how to set frequency, offset, tone, and power level for each radio. It then describes how to write that to a memory, and select that memory. It also provides instructions on locking/unlocking, adjusting volume and squelch, and resetting the radio to defaults. The Guide also includes descriptions of common problems that users of each radio might run into, and how to resolve them. The Handheld Radio Field Guide (ISBN 978-0-9996609-0-4) is published by Listening Bird Press, and is available on Amazon or through your local bookstore for $22.95. For further information see the book's website here. The Handheld Radio Field Guide may be the solution to front panel programming in your go bag. Have a Field Day Safety Officer, and have a great, safe Field Day! There's a 100-point bonus for groups setting up Class A stations that appoint a Safety Officer who verifies that all safety concerns on the Safety Check List (see below, and the ARRL Field Day Packet) have been met. But, beyond the bonus, in my opinion, every Field Day group should appoint a Safety Officer to spot and mitigate the potential hazards that can challenge participants who naturally are often concentrating on speed of setup, and running up the Q's. Sometimes shortcuts are taken, accidents can happen, and occasionally serious incidents occur. So, in these days before this weekend's Field Day, take a time out to ensure that your Field Day scene is safe. Think Safety First! Here is the ARRL Field Day checklist for Safety Officer affirmation and bonus. It's a good starting point -- identify others on your own! Safety Officer or a qualified designated assistant/s was on site for the duration of the event. Fuel for generator properly stored. First Aid kit on hand. First Aid - CPR - AED trained participant/s on site for full Field Day period. Access to NWS alerts to monitor for inclement weather. Tent stakes properly installed and marked. Temporary antenna structures properly secured and marked. Site secured from tripping hazards. Site is set up in a neat and orderly manner to reduce hazards. Stations and equipment properly grounded. Access to a means to contact police/fire/rescue if needed. Safety Officer is designated point of contact for public safety officials. As necessary, monitoring participants for hydration and ensuring an adequate water supply is available.